Individual 6" Aluminum House Numbers - - made in USA. Made from 0.25" solid aluminum. Finished with exterior UV-stable powder coat to withstand harsh elements. Includes color-matching stainless steel mounting screws; wall anchors for mounting to hard surfaces such as concrete or brick; and (optional) 0.5" stand offs that create a 3-D or shadow effect. 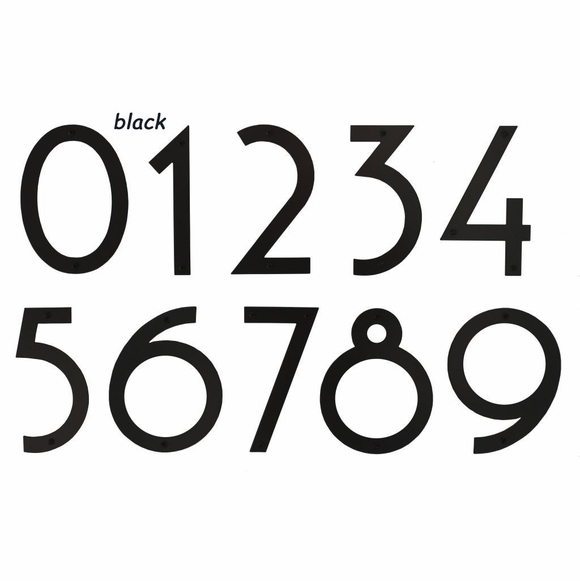 Numbers are 6" high and vary in width from 1.75" to 4.625". #s 5 and 7 are 3" wide. #s 6, 8, and 9 are 4.625" wide. Numbers generally ship within 3 business days.